What do you think will happen when you remind him that walking away is not a very elegant way to solve a problem? Well, he will look at you with compassion and reply dryly: "Better mind your own business." Strangely, in spite their idolization of freedom, Parisians do everything at the same time. I don’t know of another place on earth where life is organized by such a strong collective rhythm. Yesterday was la rentrée. It’s the day of the year. It’s the beginning of the school term. You wonder why it falls in the middle of the week? That’s freedom, I guess. 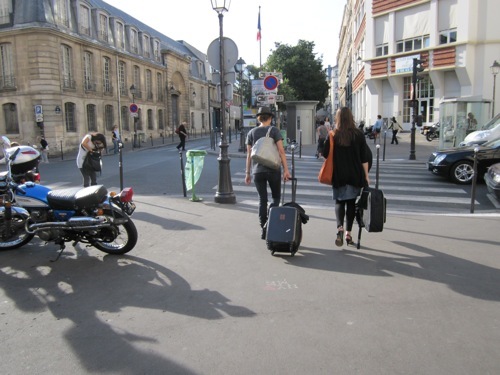 After two long months of agonising, while Paris was in the hands of the tourists, the Parisians are back. All of them. The suntanned girls sitting on the terraces of the Cafés show off their faultless legs. The busy waiters are rushing hectically in and out. The kids are back, the cars are back, everybody is back. I have to admit, I love this moment. It’s when you can feel the energy, the excitement, the power of Paris. Yesterday, when I walked out of a small park in the Marais, where the kids play after school, somebody, a girl was shouting a name: “MARION!” There was so much thrill in her voice that I turned around. Two girls where falling into each other’s arms. One of them was Marion Cotillard, Oscar winning actress, la Môme, Lady Dior, the star. It looked as if these guys hadn’t spoken since Marion got her Oscar and became a Hollywood star. First I wondered why the hell a star like Marion Cotillard doesn’t take a cab? Well, the answer is easy: She is extremely environmental conscious, and has been for many years. She is absolutely ecologically committed. Ten years ago people laughed at her in France. In the meantime even here it's become common sense. The interview is quite something. Marion talks about her grandmother who is 101 years old and sill in good shape. She talks about death and what comes after. She is not sure whether we have many lives or whether we get reincarnated into a next life. "But", she says, "I really do think that when you die, it doesn’t stop. I think we’re part of the same energy. It’s funny because when I was working on La Vie en Rose, I connected with an energy that was not entirely mine."